Imagine yourself 12 years old, standing on what was then called the Public Dock, the west wind whipping fast across your cold cheeks. 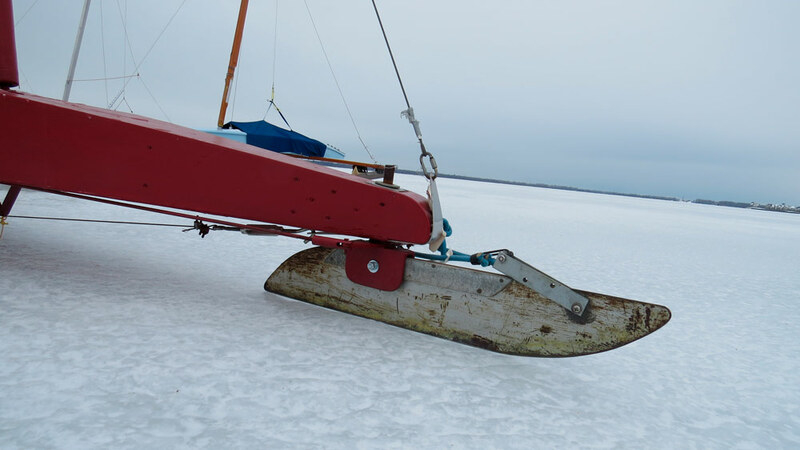 Out on the frozen bay is a small, skeletal sailboat suspended no more than eight inches above the ice. The sailor looks tiny in the craft, one hand tugging at the rope controlling the sail, the other holding a tiller in front of him. The boat moves swiftly — and what seems like silently from your distance — in the sharp winter gusts. With one particularly forceful burst of wind, a runner on one side of the boat lifts up and your heart catches in your throat. Will he crash? No, he just sets back down and then comes about to head in the other direction. Your heartbeat delightfully quickened, you want to march right out there and say to that sailor, "Teach me how to sail. I must do this." Thus began my long-unfulfilled quest to take to the bay on an iceboat, about 45 years ago. That ambition was finally realized early last month when I met Alec Dale, the skipper of a stingray-style craft, on the shore at the Erie Yacht Club where iceboats muster. There, I learned about the different classes of boats — or "yachts" as they are sometimes called —as I walked among those secured on small saw horses right on the bay. There are Arrows, Skeeters, Nites, DNs and Sweet Sixteens, each with their own features. Some are for solo sailing while others hold two people. Some are modified versions of original designs. The one thing they all have in common is that the steering runner that is the "rudder" is in the front of the boat, unlike the rear placement in a conventional "soft water" sailboat. Two other runners on each side of the cockpit are fixed onto ends of a springboard that runs perpendicular to the body of the boat. 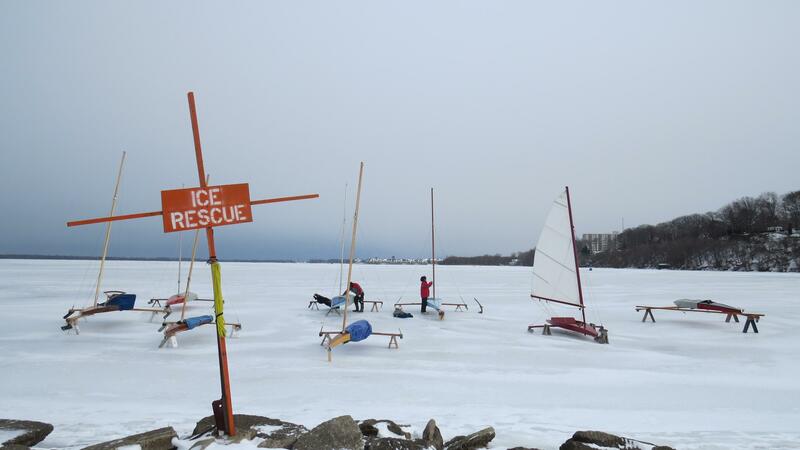 Only the runners touch the ice when sailing. The smallest of them is the DN, which has an interesting history. Prior to the early 20th century, most ice yachts were larger, held more people and were stern-driven. They were expensive and available only to the wealthy. In 1937, the Detroit News (hence, DN) invited iceboat enthusiasts to design a small, portable iceboat that would be affordable and able to be built by the average person. They opened their hobby shop to those willing to try. The winning design was the Blue Streak 60, but in test runs, difficulties were discovered and revised plans were drawn. Many years and modifications later, the DN is now the most abundant class of iceboats around the world, with many sailors building their crafts themselves. Dale's stingray, sometimes called a Double DN, was a 1950s attempt to turn a DN into a two-seater and made it possible for me to ride along. Our first go at it fell flat when light southeast winds didn't provide enough oomph to get us moving. After numerous attempts with Alec pushing in hope of catching a breeze and me steering, we eventually gave up and headed to shore. Once there I quizzed other boaters about their enthusiasm for the sport. 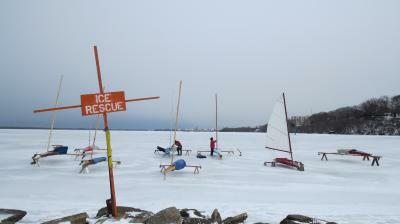 Chris Wolford, who has been ice sailing for 45 years, said, "We sail in the summer but Erie winters are long. This gives us the chance to sail all year." He also added with a grin, "It also gives us the chance to sail fast." And speed is one of the major draws of iceboating. The low friction of ice along with the combination of sailing physics and design mean that even in light wind, a well-tuned boat can sail at 8 to 10 times the wind speed. So, for example, a 10 mph wind can translate into an 80 mph sailing velocity. Iceboats are whisked into motion when the sails catch the wind, propelling the vessel over the ice on its runners — often at highway speeds. The possibility of high speeds, proximity to the hard surface, and the chance of finding unexpected weak spots in the ice, can make this sport dangerous. General rules of safety include never going out alone, wearing a helmet and flotation device, knowing the right-of-way rules and being prepared with both the knowledge and equipment to remove yourself from the chilly water if you happen to fall through. Most boaters carry specialty ice picks for getting a better grip when and if they find themselves in the water. So why the heck does anyone do this? "It's fun, plain and simple," said John Orlando, past commodore of the EYC and an ice-boater for 20 years. "It's an absolute rush to be out there." Yes. Yes it is. And, in fact, it's just as thrilling as I imagined it to be. For our second attempt, there was a west wind of 10-15 mph and the sun was even shining. We had no trouble catching a breeze and before I knew it, we were hurtling across the bay towards Presque Isle at a good clip, the loud clatter of runners rattling in our helmets and ice chips hammering our faces. I was grinning. It sounded and felt like an old wooden roller coaster that jangles your body and nerves. It was not the silent, smooth ride I imagined so many years ago. It was, perhaps, better. After a few trips across the ice, with Dale demonstrating some steering and turning techniques, he gave me the tiller, while he worked the sail. I fretted a little as we approached my first tack maneuver, but I pulled it off and did a few more. Other faster boats whizzed by us under cloudless blue skies. Bumps of ice and patches of snow knocked us around, and the fresh, cold air cleared any winter cobwebs from my brain. Every turn provided a new thrill and put a brighter gleam in the eyes of this now-12-years-old-again kid. We only got up to 35 mph, approximately, but I already wanted more. One thing I learned when joining this jovial group of daredevils on the banks of the bay was that you don't need to be a member of the EYC to use the iceboat area. There may be one more DN pushing off from there next year: mine.